It's amazing the number of people who end up at computer repair centres simply because basic precautions have not been taken to protect their precious machines. One of the most common reasons for failures or problems in computers is the lack of antivirus software, or expired antivirus software. It is an issue which is often overlooked and has dire consequences for the unfortunate computer owner. So, like a human virus a computer virus can be dangerous and possibly infectious to other computers.They can be spread between computers, and can also be transported via email. It is not limited to software however, as they can also be transported via usb drives and other types of media. Where Does a Computer Viruses' Come From? Computer viruses are usually malicious computer programs written in order to damage other people's machines or steal information or even cash. They are usually highly skilled programmers who have decided to use their skills in a negative manner. Some viruses are written as an "ego" boost. In other words, some programmers write these things just to prove that they can hack into a major site or obtain private information. However, there are also criminal programmers who have a much more devious intention. What Types of Virus Are There? Sometimes the definition of what constitutes a virus is not clearly defined. In general a virus almost always damages files on a computer. Some other types of malicious software such as spyware is used to steal information from the user but may not damage the computer. Worms: These are programs which copy themselves to other computers on a network. They tend to slow things down as they consume more and more bandwidth or computer resources. Malware: Technically, this is not classed as a virus. It is software used to spy on computer user's activities and collect personal information. More commonly known as "spyware". So What Does Antivirus Software Do? Antivirus software is the "policeman" at the gate of a computer system. It protects the computer from incoming threats and seeks out, destroys and warns of possible threats to the system. New viruses are coming out all the time. 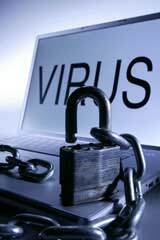 It is the job of the antivirus software to keep up with the latest threats. This is achieved by daily updates of the antivirus database definitions, which counteract the latest threats to provide constant protection. But Isn't The Cost of Antivirus Software Expensive? One of the most common problems faced by computer owners is when their "trial" antivirus software has run out and they do not upgrade to the full version. This is usually to avoid the cost of paying for the full version. Sometimes, computer owners without antivirus software may not notice any difference for a few months. Then one day the machine stops working altogether. What is the end result? The repair centre has to completely reinstall the system. This may also include the purchase of a new windows licence and the added cost of reinstalling the system. Oh, and then there is the recovery of existing data. More costs! So what started out as avoidance of purchasing antivirus software ends up with a wrecked system! This can cost hundreds of pounds! Whilst it is true that some versions of antivirus are more expensive than others, it is important to have a valid version of antivirus software on a computer at all times. Some are even free, such as AVG Free and Avast. They are excellent products and provide adequate protection against the majority of today's computer virus. Not having anti virus on a computer is like inviting a criminal into the home or having an uninvited guest! They then cause havoc or steal from the owner. Today's internet has provided many ways for virus attacks and there are thousands of threats. To be safe from these it is vital to police the computer and have it protected at all times. The Importance of Antivirus Software cannot be underestimated.